The curriculum covers calculus (including multivariable calculus), differential equations, matrix algebra, statistics, chemistry, calculus-based physics, engineering mechanics, thermal sciences, and other engineering knowledge. The knowledge is applied throughout the curriculum for modeling, analysis, and design. The curriculum includes three required engineering laboratory courses in addition to laboratories in chemistry and physics. The students learn various experimental techniques and get familiar with important experimental equipment. They are required to analyze experimental data and to draw conclusions and insight from the data. The students also have the opportunity to design experiments such as deciding on the set-up and parameters. Students may be exposed to additional experimental components in some electives and extracurricular activities such as SAE formula racing cars. Based on mathematics, science and engineering knowledge, the students learn various aspects and stages of the design process, including architecture, modeling, analysis, simulation, technical specifications, objectives, and optimization. The students will consider various factors such as economic, environmental, social, political, ethical, health and safety, manufacturability, and sustainability. The students develop teamwork experience in a number of courses in completing team projects and group experiments. Team members may focus on different parts of the projects that involve team members from different disciplines. 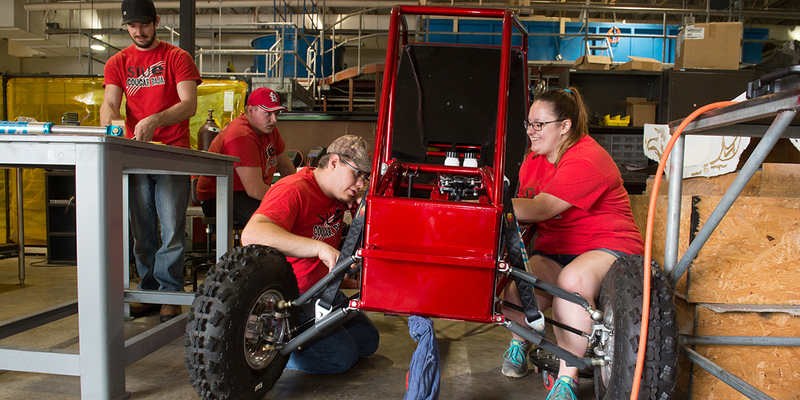 In some cases, such as freshman design, electives, capstone design, and extracurricular activities such as SAE Formula Car, a team may include members from different engineering disciplines. Numerous required and elective engineering courses in the curriculum contain problem-solving contents. Through these courses, the students learn to interpret problems from various setting, identify engineering problems, formulate them in an appropriate form, and complete solution using analytical, numerical, and other appropriate methods. The students are required to take a course on engineering ethics. They are also taught their professional responsibility as an engineer and be exposed to ethical issues in various engineering practices. They also learn the need and appropriate ways to acknowledge previous works done by other people. Students are also required to complete an essay to address ethical issues and societal impact of their design in the capstone design courses. The students are required to complete two courses on English writing and one course on speech communications. Many other classes, including liberal education and engineering courses, also require significant assignments on writing or oral presentation. The curriculum contains a significant general education component, including introductory and distributed courses on social science, arts, and humanity. The students are also required to take engineering ethics and engineering economy. The students are required to write an assay to address ethical issues and societal impact of their design in the capstone design courses. Through these courses, and in the context of engineering courses, the students gain a broad perspective on the role of an engineer and the impact of engineering practice on economic growth, environmental evolution, international relations and globalization, and the society, as well as the impact of these issues on engineering practice. In most engineering classes, the engineering faculty members convey to the students the need for life-long learning throughout their professional career. These may include taking training courses, picking up materials that may be outside of their core technical background, and learning some subjects in greater depth and details. In some courses, the students will be required to look up materials other than the textbook, and to learn appropriate materials to complete a project. In some engineering classes, the instructor mentions the relevant current issues. These may include emerging trends in engineering subjects, current concerns of significant awareness, such as energy and climate change, and recent trends in job market. The students learn important skills and tools for engineering practice. Examples include computer graphics and animation, numerical simulation and optimization using computer software packages, instruments and equipment for data acquisition and digital signal analysis.